The Comic Weekly Man combined two pastimes important to American families, Radio and Comic strips. The Comic Weekly Man brought comic strip favorites to life in a way most strips had never been heard. One amazing aspect of this program is just how many voices were heard each week. 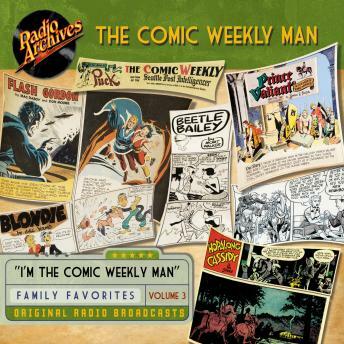 The Comic Weekly Man, voiced by veteran radio actor Lon Clark, voiced all the male parts while Little Miss Honey, a young girl, assisted with the female roles. A whole cast of comic strip heroes and villains performed by two actors.